This Engrish has no traction. And your no English major. You must be tyred as well. The tattooist was too tyred to worry about spelling. 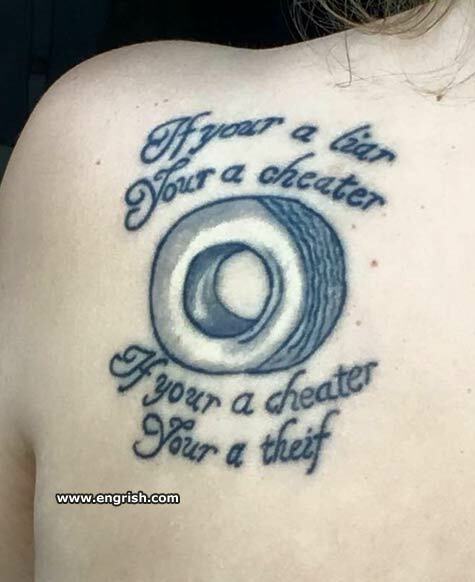 With the right a-tire you’re bad tattoo wouldn’t show. A theif is someone who staels. And if your a theif your going to the deivl. I before E except after the wrong homophone. If you are a LIzARd, you are a Cheetah. Halloween may be over, but this spelling of this tattoo is one of the spookiest things I’ve ever seen. Be careful how you ask for a “don’t tread on me” tattoo. He comes from a band of southern gypsies. They steal tyres for Colonel Sanders. But! You have to take off your attyre to get this tattoo. Maybe the Michelin factory souvenir store isn’t the best place to get a tattoo. I really would like a permanent tattoo; what can 1 dollar get me? @brob: I had the same thought, except that the tattooed one seems a bit pale in the neck area for a native of the Near South. Maybe he just tired of her. I think wheel laugh at this tattoo. No matter how many years you’ve had a tyre, it will still go down on you. I before e except after c. Therefore it should read “chief”. Can’t decipher this. Two tire. I’m tired of this tread.